The brand Chicco came to India in 2008 and they have gradually become one of the top few chosen brands that parents trust and love. This post is a review of the 2 in 1 transform a ball based on the experiences that I and Tigger had while playing with the toy. Kids who love books are not a common sight in general. But kids who love toys – it is a well-known most prevalent scenario and every single parent in the world will agree to it. 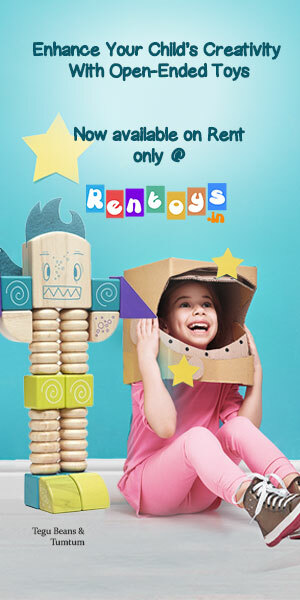 Different textured, multi-coloured, sturdy toys are a true blessing. The Chicco 2 in 1 Transform-a-ball is one such toy. I would even go as far as calling it an open-ended toy even if it falls under a ball category. Read further to know why. The box itself comes with bright colours and neat instructions on what it can be used for, and other details that assist a curious parent buying a toy. Tigger is the type of kid that loves anything that comes in a box. He plays for a long while with the box itself, throwing things into and out of the box. And since this was a bright coloured sturdy box, he just couldn’t resist himself from playing ‘in-out’ for a long time. There are some examples of how you can build shapes using the different parts of the toy. It is made for the toddlers of the age group of 2 to 3 years. It contains 11 pieces in total – 1 ball structure, 2 cylindrical eye-like shapes, 8 different colours boomerang-like shapes. These shapes can be combined in many variations to create a various combination of fun and interesting things. The only limitation to what you can make out of it is your own imagination. Tigger not just uses it to make shapes but also to improve his gross and fine motor skills. He removes the cylindrical shapes and puts it back again and again and again. Repetitive activity for some free time for the parent done right. Now, I am all for toys that help a parent and kid spend some bonding time figuring out how things work. But, I am also the kind of parent, who lets the child decide when a parent’s help is needed. After all, the more time a child deal with trying to figure things out, the more he feeds his imagination with all the creative juices. It may not be the right way (according to adults) but that is a whole array of things the kid just learnt from trying to figure how things work. This is why I called the ‘2 in 1 transform-a-ball’ as an open-ended toy. It is fun for older kids – even older than the suggested 3 years to form various shapes ranging from a dinosaur to a cool two-wheeler. For a younger toddler, we may even take it upon us to show how different shapes can be made from the various parts and ask the kid to identify what it is. It was a surprise for me when Tigger could identify a bike when I showed him. He gleefully made the motor sound ‘prrrrrr’ to tell me that he thought it was a bike. Then he spent some time playing with the bike, trying to make the wheels turn. Now coming to the learning aspects of a new toddler. The bright coloured shapes, also help the baby identify and recognize various colours. A toddler has a very curious mind and always is ready to learn. These shapes help the baby learn the different colours. Tigger cannot yet recognize colours by name but he can very well put the colours in the right group. So when I showed him the red coloured shape along with two other groups of toys he already had – one group green and the other red. He first put the red shape with the green group as it was closer to him but then he looked into it and immediately removed the red and put it with the red group. It is so amazing to see them do something like this when you don’t expect them to understand what it is, that you are trying to show them. But, kids are continuously full of surprises – good and bad. It takes them a while to figure out how a toy works, it helps them learn, it keeps them entertained while the parent sneaks away for an uninterrupted reading session, it also helps them learn and master many a skill. The activity ball was sent for my honest review and I have written nothing biased here. Do give this toy a chance and you will find yourself agreeing with me. You know sky is the limit when it comes to learning in little children and these toys look just so ideal for them. The activity ball is so much fun. I think my daughter will love this as a gift. Fun, creative and great for motor skills. WOnderful! This looks so much fun, I am sure kids would love to get these cute balls and toys in their hands. Quite colorful too.